Dan Mullen is gone. So is the Egg Bowl bravado. 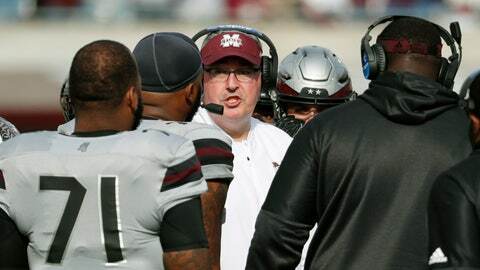 First-year Mississippi State coach Joe Moorhead will experience his first “Battle of the Golden Egg” on Thursday when the 22rd-ranked Bulldogs make the short trip to face Ole Miss in Oxford. So far, he’s shown little interest in continuing the trash-talking gamesmanship that Mullen — who left for Florida last year after nine seasons in Starkville — clearly enjoyed. Mullen never called Ole Miss by its name, instead referring to “The School Up North,” and he rarely missed an opportunity to needle the Rebels. Moorhead said he doesn’t have much use for emotional rhetoric because the benefit is fleeting. The Bulldogs (7-4, 3-4 Southeastern Conference) are a 10-point favorite on the road against the Rebels (5-6, 1-6), who have lost four straight games. “That is going to last for about a series or a half of a quarter, but ultimately, when that wares off, you are going to fall back on your preparation and you are going to win the game because of your effort and your execution,” Moorhead said. Like Moorhead, Ole Miss coach Matt Luke isn’t big on taking verbal potshots at his school’s rival. Both coaches said the game is always emotional because of the rivalry’s high stakes, but there’s no need to for insults. The rivalry has been remarkably even over the past few decades, with both teams winning 14 times since 1990. Ole Miss has won four out of the past six, including last year’s 31-28 upset in Starkville. Ole Miss can get to six wins with a victory against Mississippi State, but there will be no bowl game for the Rebels. The program is ineligible for the postseason for a second straight season as part of its punishment from an NCAA infractions case. Luke said he’s proud of the senior class for playing hard despite the sanctions. Ole Miss quarterback Jordan Ta’amu needs just 212 yards in the Egg Bowl to break the school record for passing yards in a season. Right now, he’s behind Chad Kelly, who threw for 4,042 yards in 2015. If Ta’amu has an average game, he should break the mark easily. He’s averaging nearly 350 yards passing per game. Ole Miss hopes Scottie Phillips will be able to play in Thursday’s game after missing the Vanderbilt loss with an ankle injury. Phillips has run for 927 yards this season and 12 touchdowns while averaging 6.2 yards per carry. If he can’t play, the bulk of the carries will likely go to Isaiah Woullard, who has 365 yards rushing and four touchdowns. Mississippi State has 85 tackles for a loss this season, which is 13 short of the school record set in 2015. With two games remaining, the Bulldogs have a good chance at breaking that mark. Jeffery Simmons leads the team with 12½ tackles for a loss while Montez Sweat has 12. Nine different players have at least four tackles for a loss. Mississippi State quarterback Nick Fitzgerald is back in the Egg Bowl one year after suffering a gruesome dislocated ankle in the first quarter of last year’s game between the two schools. He managed to recover and has had another quality season, throwing for 1,504 yards and running for 901 yards.